Western folks have a whole different slant on thing than we eastern folks do. The land is broad. The work hard. Rarely did they gather together 'for a night on the town' unless it meant business in the "Big City". But folks found ways to bring families together. Ranching and farming brings its on special charm. You can't just put the animals out in the field and expect them to take care of themselves. Neither could you put the seeds on the ground and stand around waiting for them to sprout. These life styles were labor intensive. 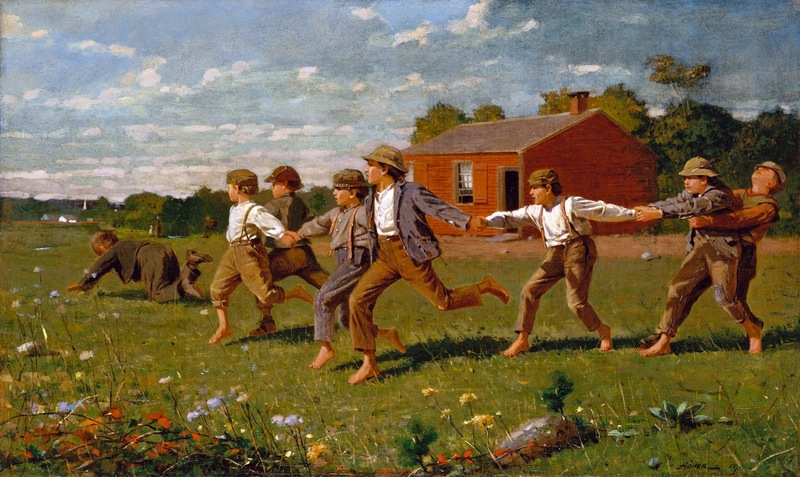 So just what did the men and women of yesteryear do for fun? 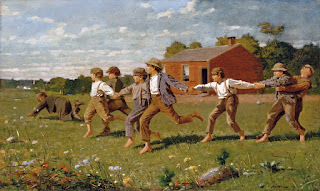 Believe it or not, hide and seek, tag, ring around the rosie were common things played by children once chores were completed. As always, chores came first. 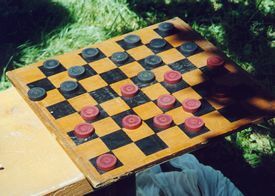 At night, chess or checkers might be played. Young girls might sit at their mother's knee and learn embrodiery stitches, quilt, crochet, or knit. These were things that came in handy when a house and family of their own were in the future. Harvest and round ups provided families with the ability to join together and help out with the work. Neighboring ranches might blend their hands together to brand cattle for trail drives. Once the animals were taken care of, a barbeque with dancing and music might add to the festivities. Farmers might work together to bring in the crops. Rotating between different farms would make the labor easier for all included. Of course, many might bring along their mouth harps, a fiddle or two, and once the dishes were done, they would play a couple of tunes to stretch out the meetings. Loneliness proved to be the biggest enemy of all. Our lives seem filled to near bursting today, but when we think about the way of life just a meer century ago, we have it so easy. 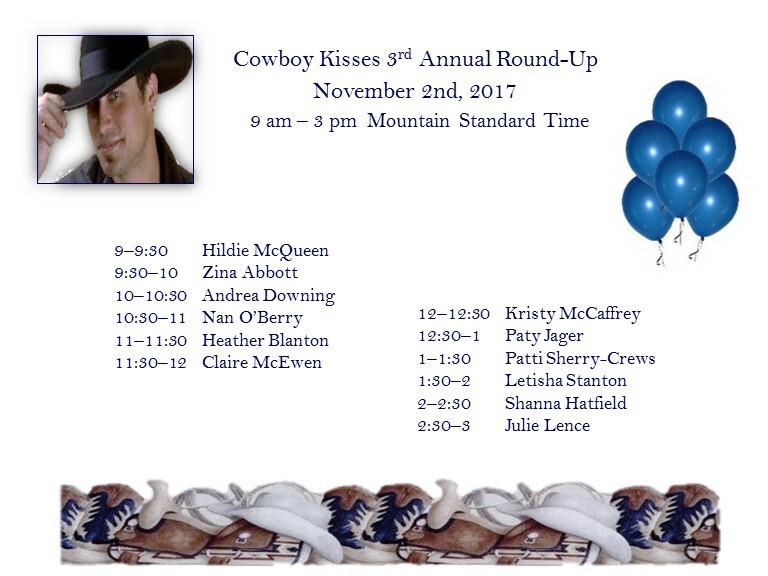 Below is the list of authors attending and their time to participate in the party. Plan your day around your favorite authors or stay entire the Round-Up. We enjoy chatting with fans of the western romance genre and hope many of you will attend. I will be there all day hosting and to assist with any questions or problems. This is a Western blog. Out west, people, including the ladies, weren't big into frou-frou like they were back east. In the West, women had to be tough. They had to work hard. They had to be practical. They also were the civilizers of the West. Many of them came from the East. They brought their religious and character values, and their social skills, and their fashions with them. 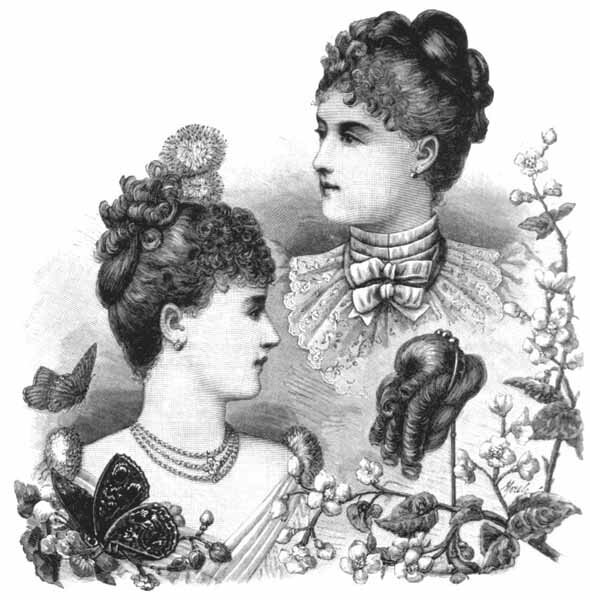 In the 1870's and 1880's, that included not only bustles, but frou-frou. Frou-frou, as in lace and buttons and ribbons and feathers and ruffles and ruching and pleats and fancy hair combs and a host of other gew-gaws -- personal decorations to boggle the Western male mind. 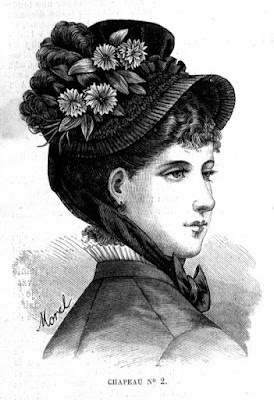 And for special occasions, such as a dinner with the town mayor--whether he wore a stylish plaid business suit and derby, or dusty cowboy boots and a Stetson--the piled-up hair of the hostess emulated Eastern designs found in the latest issue of Godey's Magazine, and was decorated with frou-frou. I received many positive comments about the cover, although a couple of readers noted the dress looks like it is from the 60's. 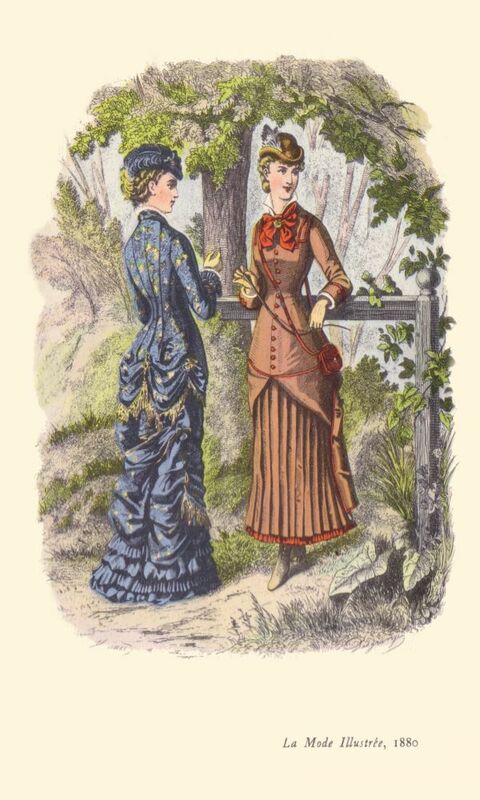 Actually, as a ballroom gown, it's not far off for being typical of either the 1860's or 1960's. Yes, it is on the cover of a book set in 1881. 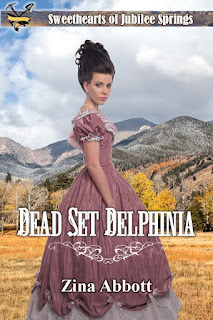 However, in order for an author to not use an image of the same model wearing the same outfit you see on every other historical western romance book, sometimes an author has to fudge a little. The hair drew the most negative comments: "Disconcerting." Yup! It does look a little like the good ol' beehive of my salad years. Not really late 1870's-early 1880's style. 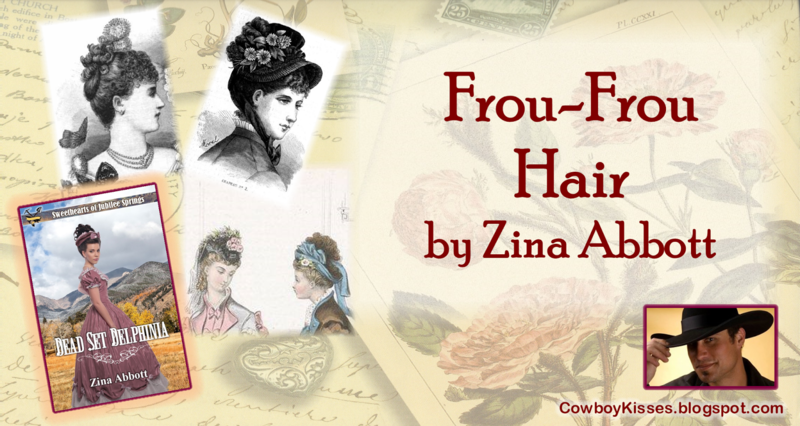 Add some frou-frou, and whallah! Period-correct hair. No more helmet hair. No more looking like a football landed on her head. This fancy outfit, complete with frou-frou from her hair to her toes, is just right for my recently "from back East" Delphinia who shows up at the harvest dance held in Jubilee Springs, a backwoods Western mining town, especially when she thinks she has deliberately worn an outdated and understated gown to the event. 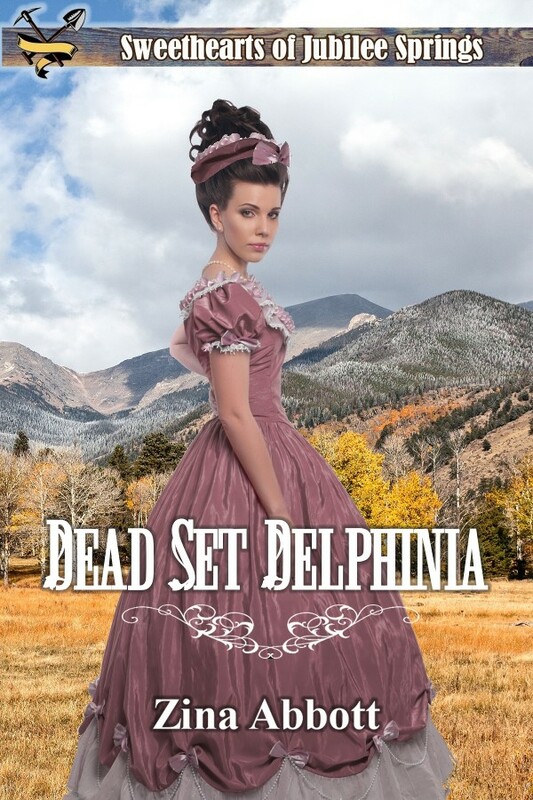 Dead Set Delphinia is not on preorder, but is scheduled to be released next Tuesday, September 26th. On that day it will be available at the release day price of $.99. After release day, the price will be raised to its usual amount. It will also be available for Kindle Unlimited. This is Book 11, and my fourth book, in the Sweethearts of Jubilee Springs series. Bennett tipped his head and raised an eyebrow as he watched her once again focus on a dining room sideboard made of walnut and stained dark. He knew all these things. He had particularly been painfully aware of every failing she had mentioned, especially once Gerald Shumaker had warned him he would be bringing in his wife to look at dining sets in the next few days. However, who did this woman he had never seen around town until now think she was, waltzing into his store and telling him how to manage this showroom? “I’m not the clerk; I’m the owner, Bennett Nighy. 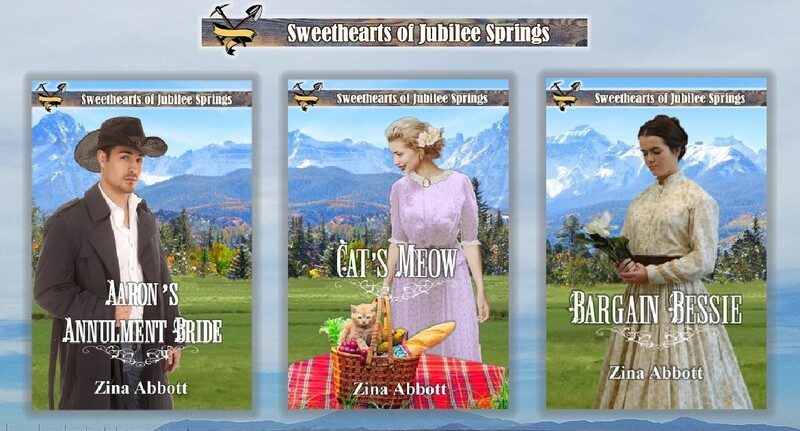 I have three novellas in the Sweethearts of Jubilee Springs series available. One can only imagine how difficult it must have been to be a woman in the nineteenth century trying to have a career. Mary Jane Colter, born in Pennsylvania and brought up in Minnesota, certainly succeeded by both strokes of luck and strokes of genius. When Colter’s father passed away in 1886, she apparently took it upon herself to learn a trade in order to help with family finances. She attended California School of Design—apparently in an all women’s class. Graduating in 1890, she apprenticed with a Californian firm and learned the then-popular, revived California Mission style. Sadly, her talents were put to other use for several more years, teaching at the Mechanic Arts High School and University Extension School in St. Paul. Then, by a stroke of good fortune, she came to the attention of Minnie Harvey Huckel, daughter of Fred Harvey who was building hotels and restaurants along the line of the Santa Fe Railroad. While my colleague, Julie Lence, will be telling you all about Fred Harvey and the ‘Harvey Girls’ in a blog in a couple of weeks, I will concentrate on Colter’s works for the firm. 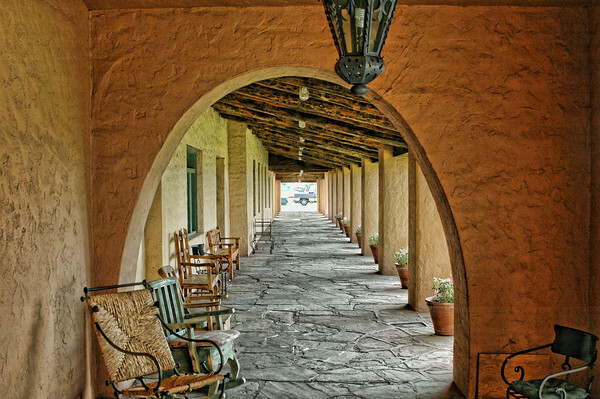 Colter was originally hired for a summer job in 1902 decorating the Indian Building at the Alvarado Hotel in Albuquerque. The building was the hotel’s gift shop basically, and Colter created a series of rooms of both Hispanic and Native American design. 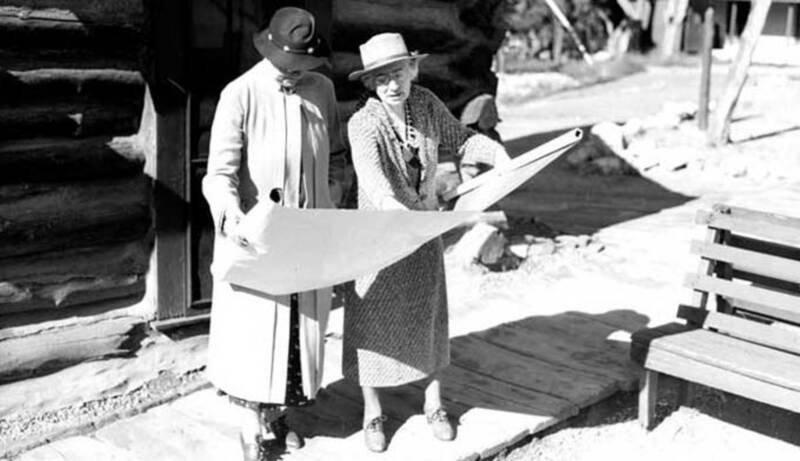 She would go on to work for the Fred Harvey Company for thirty-eight years, doing both architecture and decor. It was Harvey’s exclusive contract with the Atchison, Topeka, and Santa Fe Railroad to provide hotels and restaurants between Chicago and Los Angeles that would afford Colter those years of work. Colter spent time working as a display manager for a department store in Seattle before being hired permanently by Harvey in 1910. It was then she branched out into being both architect and decorator. Her first works continued at Grand Canyon. The area had been declared a National Monument in 1908 by President Teddy Roosevelt and while it was not until 1919 that it was established as a national park, tourism was definitely on the rise. 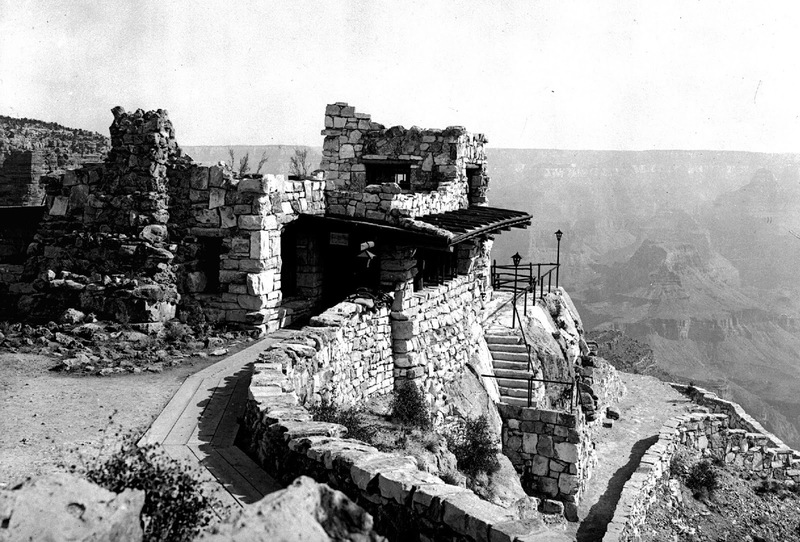 When the ATSF Railroad brought in trains from Williams to Grand Canyon in 1901, making what had been a bone-jarring trip over rutted roads obsolete, the Grand Canyon’s fate as a tourist destination was sealed. Canyon’s South Rim. Another artisan sales building, it stands in contrast to El Tovar next door, which was done by another architect in the western chalet style. Hopi House is stone and was based on pueblos. It has the look of having been there before the idea of a national park ever took hold. At Grand Canyon, Colter also created Hermit’s Rest and Lookout Studio and, after World War I, Phantom Ranch at the bottom of the canyon. Colter’s imagination often took form from stories surrounding the buildings. For instance, Hermit’s Rest was named for Louis Boucher who used to guide tourists into the canyon in the 1890s and for whom Hermit Canyon was named. Phantom Ranch was not only named for Phantom Creek but, in her mind, for the many ‘ghosts’ that roamed the area. La Posada Hotel in Winslow, Arizona (1929). Her vision for that was of the hacienda of a wealthy Spanish Colonial landowner, and she designed everything from the china to the gardens. While much of Colter’s interior design is gone—furniture, uniforms, lighting and so on—it has been restored and is now on the National Register of Historic Places along with ten other of her buildings, five of which are designated National Historic Landmarks. 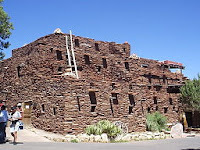 Her last work before her retirement to Santa Fe in 1948 was the 1947 renovation of Painted Desert Inn in the Petrified Forest National Park, AZ. A chain-smoking, tough-minded woman, Mary Colter knew how to behave in a man’s world, insisting on the details she wanted, overseeing minutiae that were of importance to her. 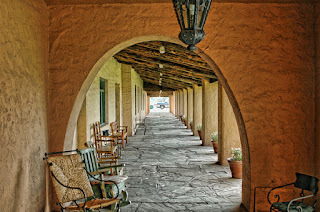 She lived to the age of eighty-eight, seeing some of her works demolished, others remodeled beyond recognition, yet today her legacy lives in buildings that capture the essence of the Southwest, functional yet timeless. Her work will live on in the Mary Jane Colter National Historic Landmark District of Grand Canyon National Park.